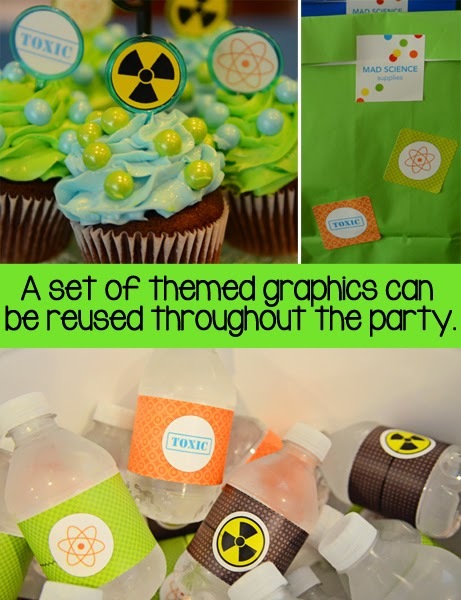 I loved using my Etsy graphics on so many different items at our Mad Science Party. You can read all about it over on the Jacksonville Moms Blog. Graphics: Although I usually like to create my own graphics, I decided to purchase some digital images off Etsy. The nice thing about purchasing a set of graphics is that you can use them for various different items at your party. I printed water bottle labels, stickers and even made cupcake toppers using the same set of graphics. Pro Tip: Before you purchase images do a search for free clip art and see if there’s anything you can use.